Zack Barsik is the founder of the Circassian Cultural Institute located in New Jersey and has been working on Circassians Affairs for the past twenty years. He is also one of the founders of the No Sochi 2014 campaign that has brought the Circassian plight back to the forefront. His work also led to the recognition of the Circassian Genocide by the Georgian Parliament. Learn more at nosochi2014.com or follow at @nosochi2014. Dave Zirin: Who are the Circassian people, where are they from, and how does this relate to the Olympics? Zack Barsik: This is something we’ve been working for over the past few years, to bring awareness to the world that the Circassians are the indigenous people of Sochi. If you look at history, we’ve been there for thousands of years, up until 1864 when Russia and the Czar Nicholas I culminated a 101-year war by eradicating, erasing Circassians from history. In those days, any news, or any journal where you would find the word “Circassian” was on the front pages in Europe. And we disappeared for 150 years, until Sochi was picked for the Olympics. Circassians used to be part of the ancient Olympic games, and being a Circassian also means that sports are very important for our culture. However, now with the Sochi Olympics we have absolutely no role in the Olympics in our capital, which is Sochi. Isn’t Sochi a Circassian word? That’s correct. It means ‘The Land Between Sea and Mountain.’ Many events that Olympians and guests of Sochi will see will be in Fisht Stadium. Fisht is another Circassian name. In Russia, what they’ve done is take everything that’s Circassian, but invite no Circassians to the party. What happened 150 years ago? I’ve heard it referred to as the Circassian Genocide. What took place? What are the demands of No Sochi 2014? What is Russia’s explicit justification for denying right of return for Circassians? Have they said anything explicitly or is it just that they ignore the demand? They ignore the demand. We constantly ask the government for some response, trying to create a dialogue, but their answer is always pretty much the same. You’re a small nation, you’re a victim of colonialism—deal with it. I know that people from No Sochi 2014 were able to travel to Vancouver for the 2010 Olympics and to the London Olympics in 2012. Were those trips beneficial for you? What kind of connections were you able to make and what kind of similarities to your cause did you see? We have to thank those two events for bringing the case up to the international level. Russia’s been trying to keep this a Russian problem, but Circassians live in fifty-eight countries. We make up 10 percent of the population of Turkey. But even our own communities were shocked to see Circassians going to the Olympics and demonstrating because they didn’t know the message, this important message that needed to be told. And, by the way, we wanted to go to Sochi, but they didn’t let us in. Talk about that for a second. What did you want to do for the 2014 games? Did you submit visa papers? Was there an official response from the government? Well, an official response we’re never going to get from the Russians. They’ll just deny and say that you were not accepted and that’s it. Constantly calling and we’re not able to get any feedback. It’s pretty much the same for anyone: for journalists, for activists—we know that there are activists for the environment there that were just shipped out of the region and sent to Moscow. Just to keep them out of Sochi. Let’s take a step back. There’s obviously, as you’re well aware, myriad issues of injustice surrounding these Olympics, from worker rights, to the environment, to LGBT rights, to now animal rights and the rights of the Circassians. So many issues surround these Sochi Games. The terms of the debate around this Olympics have been, should countries just boycott the games because there’s so much injustice taking place? Or should athletes view it as a vehicle for dissent because boycotting wouldn’t really do anything? What’s the position of No Sochi 2014 on boycott versus using the games to raise awareness? 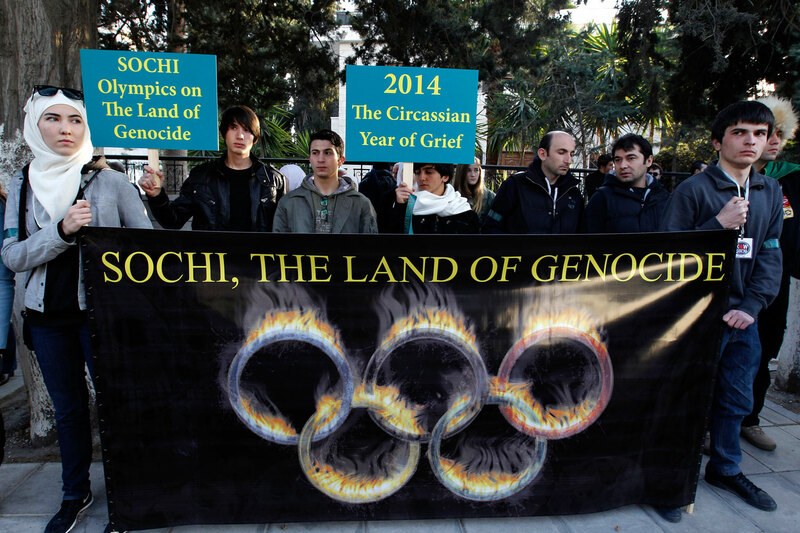 As a Circassian, No Sochi 2014, just because it’s on the land of genocide, we definitely until now believed in the boycott. There is no peace and harmony in the sports being promoted when you’re dancing on the graves of 1.5 million people. Now, this is not the Olympians’ fault. We do understand that the Olympians, the majority, are not aware of this. We did send packets to all the Olympic Committees around Europe and America. We found out that in Sweden they refused to give these packets of information out to their athletes. So there is this block of information to Olympians because perhaps when they are made aware of these atrocities they’ll boycott themselves. We are not against the Olympic spirit. We understand that this is part of sports, but we have to make everyone aware of this dark side. One point that I’d like to make is that Putin has hidden this from the world. The world’s going there expecting gold medals, 150 years ago Russia was handing out gold medals to Russian soldiers for committing a genocide. I know that when you were in Vancouver you met with indigenous groups there. What connections do you see as a Circassian with the Native Americans, the indigenous community in the United States and Canada? What connections have you sought out? We have a lot of parallels with the Native Americans, the First Nations. One of the leaders of the First Nations visited us in New Jersey and we had a panel. There’s so many similar stories and a common history, and it happened at the same exact time. So the 1850s and the 1860s were very harsh for the Native Americans and the Circassians. We do see the parallels. If you don’t feel connected to your land, you lose your spirit. A Circassia without Circassians is no longer Circassia.